Summary: We report the CT and MR findings in a patient with malignant peripheral nerve sheath tumor in the parapharyngeal space who had neither a family history nor stigmata of neurofibromatosis. A high-resolution CT scan of the temporal bone revealed bony erosion and widening of both the foramen ovale and the bony portion of the eustachian tube. 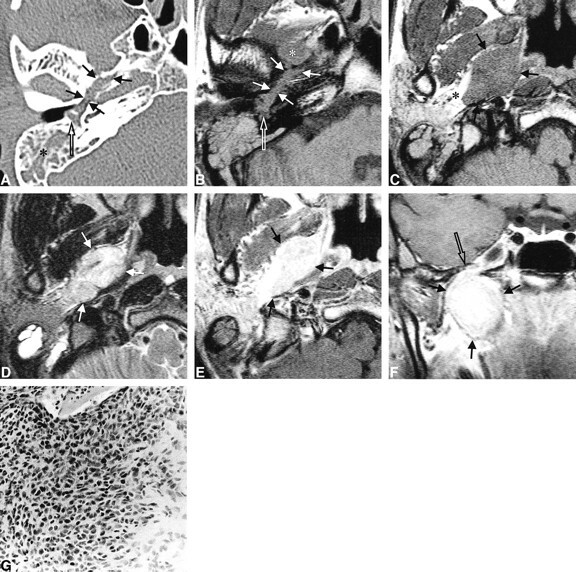 A temporal bone MR image showed an intensely enhancing solid mass in the parapharyngeal space, which extended into the middle ear cavity via the eustachian tube. Malignant peripheral nerve sheath tumors are rare malignant counterparts of neurofibroma or schwannoma. A search of the English-language literature disclosed four cases of malignant peripheral nerve sheath tumors arising in the parapharyngeal space, one of which was associated with neurofibromatosis (1). We report the CT and MR findings in a patient with malignant peripheral nerve sheath tumor arising in the parapharyngeal space with extension into the middle ear cavity via the eustachian tube. A 35-year-old man presented with a 7-month history of right tinnitus and hearing disturbance. The patient had neither a family history nor stigmata of neurofibromatosis. He had undergone a right myringotomy at a primary clinic 6 months previously, but his symptoms had progressed. On otoscopic examination, a reddish nodular mass was found in the middle ear cavity, and the possibility of a vascular tumor of the middle ear cavity was considered. For further evaluation of the mass, high-resolution CT and MR imaging of the temporal bone were performed. The CT study showed a mass filling the right middle ear cavity, causing widening and erosion of the eustachian tube as well as the ipsilateral foramen ovale (Fig 1A). The MR examination showed an ovoid homogeneous solid mass in the right parapharyngeal space, which extended into the middle ear cavity via the eustachian tube (Fig 1B). The mass had a relatively well-demarcated margin, but was not encapsulated; it was isointense with muscle on T1-weighted images, slightly hyperintense on T2-weighted images, and enhanced well after injection of contrast agent (Fig 1C–E). A part of the mass also extended into and widened the ipsilateral foramen ovale (Fig 1F). The differential diagnosis included malignant tumor of the minor salivary gland with perineural extension and benign nerve sheath tumor. 35-year-old man with a 7-month history of right tinnitus and hearing disturbance. A, Axial high-resolution CT scan shows tumor extension into the middle ear (open arrow) through the eustachian tube and widening of the bony eustachian tube (closed arrows). Mastoid opacification (asterisk) is secondary to eustachian tube obstruction. B, Axial T1-weighted MR image (550/20/2 [TR/TE/excitations]) at the same level as A shows tumor filling the eustachian tube (closed arrows) and middle ear cavity (open arrow), extending from the parapharyngeal tumor (asterisk). C, Axial T1-weighted MR image (550/20/2) shows an ovoid homogeneous mass (arrows) in the right parapharyngeal space isointense with surrounding muscle. The mass has a well-demarcated margin and displaces parapharyngeal fat laterally (asterisk). D, Axial T2-weighted MR image (4858/112/4) at the same level as B shows slightly hyperintense mass (arrows) in the parapharyngeal space. E, Contrast-enhanced axial T1-weighted MR image (550/20/2) shows homogeneously intense enhancement of the parapharyngeal mass (arrows). F, Contrast-enhanced coronal T1-weighted MR image (722/20/2) shows the enhancing mass in the parapharyngeal space. Note close relationship between the mass (closed arrows) and the foramen ovale (open arrow), which is widened. G, Photomicrograph of the excised mass. The mass is made up of relatively hypo- and hypercellular areas. The cells are spindle- or polyhedral-shaped and show moderate degrees of cellular pleomorphism and frequent mitoses (hematoxylin-eosin, original magnification ×100). Wide excision of the mass was performed. At surgery, the mass appeared purplish brown in color and compressed the mandibular branch of the trigeminal nerve. The mass was tightly attached to the skull base, extending into the eustachian tube and the middle ear cavity and running from the mesotympanum into the aditus ad antrum. Because the tumor was fixed to the base of the skull, it was partially removed without sacrificing the trigeminal nerve branch. The cut surface of the excised mass was mostly yellowish tan without hemorrhage or necrosis. Microscopic examination showed alternating hypo- and hypercellular areas in spindle- or polyhedral-shaped cells (Fig 1G). There was a moderate degree of cellular pleomorphism, and mitoses were found frequently. Immunohistochemistry showed a strong positive reaction for S-100 and a negative reaction for cytokeratin, desmin, and smooth muscle actin. The pathologic diagnosis was malignant peripheral nerve sheath tumor arising from the mandibular branch of the trigeminal nerve. Radiotherapy was administered as an adjuvant therapy, with 6000 cGy given to the parapharyngeal space and the skull base. The patient was grossly free of symptoms 5 months after surgery. Tumors of the parapharyngeal space are relatively uncommon, representing only 0.5% of all head and neck tumors (2, 3). About half the parapharyngeal tumors are nerve sheath tumors, and another 30% are of salivary gland origin. Malignant peripheral nerve sheath tumors are rare, highly aggressive tumors capable of arising de novo or from preexisting benign neurofibromas or schwannomas. From 25% to 70% of these malignant tumors are associated with neurofibromatosis (1, 4, 5), and 9% to 14% occur in the head and neck (1). Malignant peripheral nerve sheath tumors usually arise in adults between 20 and 50 years of age, with a roughly equal distribution between men and women (1). Patients with tumors of the parapharyngeal space may present with few symptoms, if any, and not infrequently, a surprisingly large tumor may be discovered incidentally on examination (2). The most common presenting symptom is a palpable lump in the neck, and the presence of pain or neurologic deficit can be suggestive of malignancy (2, 3). The 5-year survival for malignant peripheral nerve sheath tumor is reported to range from 40% to 66%. The long-term prognosis for this lesion becomes even worse when associated with neurofibromatosis. The best outcome for patients with malignant peripheral nerve sheath tumor is expected after local resection combined with adjuvant radiotherapy and chemotherapy. Local recurrence, however, is also a feature of this disease (1). Malignant tumors of the head and neck region spread via direct extension, lymphatic extension, hematogenous extension, and perineural spread (6). Peripheral nerve sheath tumors spread either by neural extension through the trigeminal nerve or by nonneural extension through the eustachian tube. Widening of the foramen ovale permits the former and widening of the eustachian tube enables the latter. The eustachian tube may serve as another pathway for spread of malignant head and neck neoplasms to the temporal bone, but not as frequently as hematogenous or direct methods of spread (7). Because the cartilaginous portion of the eustachian tube is relatively resistant to invasion, such extension usually occurs along the submucosal layer of the eustachian tube (7). In a postmortem examination of a patient with nasopharyngeal carcinoma, Cundy et al (7) found direct extension of a nasopharyngeal carcinoma into the middle ear via the submucosal layers of the eustachian tube, with obstruction of the lumen. The examination also revealed very little penetration of the mucosal epithelium, but cartilage and bone destruction was extensive. In contrast to infiltrating tumors, such as nasopharyngeal or sinonasal carcinoma, this neural tumor formed a lobulated mass growing into a mechanically less resistant area. Involvement of the eustachian tube has also been reported in patients with plexiform neurofibroma, nasopharyngeal teratoma, and dermoid (6, 8). The differential diagnosis in our case included tumor of the minor salivary gland of the parapharyngeal space and benign nerve sheath tumor. Minor salivary gland tumors of the parapharyngeal space have the same location as tumors of the peripheral nerve sheath, but the former usually have heterogeneous MR characteristics. Other than adenoid cystic carcinoma, malignant salivary gland tumors usually do not spread perineurally. Benign nerve sheath tumors may have similar MR characteristics to peripheral nerve sheath tumors, but usually occur in the carotid space, displacing the internal carotid artery anteriorly and medially (9, 10). Moreover, the former do not spread through the eustachian tube. ↵1 Address reprint requests to Ho Kyu Lee, MD, 388-1 Poongnap-dong, Songpa-gu, Seoul 138-736, Korea.